Legal news for New York work-related firefighter death attorneys – One Peekskill firefighter sustained injuries combating condo blaze. Peekskill, NY (NewYorkInjuryNews.com) – An emergency call reported a condo fire at 4 Poplar Circle where Peekskill firefighters rushed to the scene to bring the flames under control Wednesday afternoon, February 17, 2010, as reported by The Journal News. Firefighters arrived ready to battle the blaze at Society Hill Condominium Complex, which was located off of Route 6, just west of the Beach Shopping Center. As firefighters began to dump hundreds of gallons of water on the flames, one Peekskill firefighter was reported to have sustained injuries while battling the blaze. His identity was not disclosed. Fire officials reported that the injury did not appear serious. It was not reported if the injured firefighter received medical attention at the scene or was taken to a hospital for treatment. It was reported that the blaze ripped through one unit of the condo, while the surrounding units sustained water and smoke damage. A firefighter assist and search team from Lake Mohegan assisted the Peekskill Fire Department at the scene. 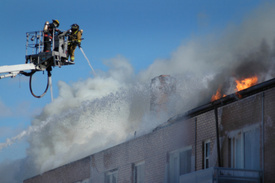 It was not reported if any residents had to be evacuated due to the blaze. Firefighters eventually brought the fire under control. It was not reported how the fire was started. The investigation continues.